Nobody wanted to do the thread for this yesterday, huh? I was too tired to move. Went to bed at 9:30! Anyway ... 6-2 to the red team. Meths (with a screamer), Phil, and Hedges x 4 (I think) for the Reds, with me scoring twice for the Blues. Blues midfield played really well, had a lot of good passing moves, but defence was occasionally ropey and disorganised - mainly down to lots of substitutions and some players playing out of position. 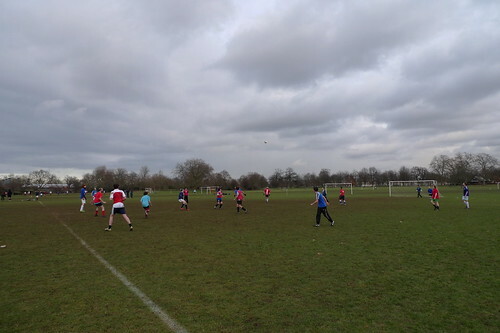 Hedges scored 4 goals (and missed about 4 more) where he bulleted through to a ball over the top. Reds defence had a very good game across the whole line. Made it very difficult for me and Tristan. I honestly think it would have been a draw, or even a Blues win if Hedges hadn't been playing. He can go in goal next game - get a taste of his own medicine. Man of the match is a tough one because you can't really give man of the match to someone on a team that lost by 4 goals, but Edd in central midfield for the Blues would get my vote - an energetic, committed battling performance. The Reds defence more played as a solid unit, but Keogh was possibly the standout at a push. Meths had a tidy game and scored a great goal. One of those three probably. For the hour or so I played I didn't feel too bad, but the walk back to the tube station was a struggle not to be sick. First half we were well organised, moving the ball around in midfield with ease and unlucky to be 1-0 down, even though we didn't have any clear chances on goal. But by the sound of it, it all fell apart in the second half. I blame tired legs and Hedges being as fresh as a daisy. Not too happy about giving away the second goal, when I should have left it for Tom to collect. Money! Most people paid me before the game, but if you failed to do so because you turned up late, please hand me 4 quid when you next see me, either at a gig or at our Feb outing. Hedges was totally the difference. When kicking downhill it was too easy to play the ball in behind the back four in the knowledge that 9 times out of 10 he'd get there first. Also made things much easier for Bamos - knowing that he could just flick the ball on rather than needing to hold it up. I've got a nice painful lump on my left foot now. I thought Blues didn't actually play too badly. It was the Reds defending quite deep, making it hard for our forwards to get in behind them, and the sheer terror of Hedges on the counter attack that made all the difference. Edd and Brooner had solid games for the Blues, with Dave doing well in defence. Dan_thw toiled up front and deserved his goals. Reds defence were immense, the bastards hardly put a foot wrong. Arhtur, I might not be around for a bit. Can I pay you via paypal/online banking? PM me your details. I think I enjoyed it, but I have a very painful shoulder. I blame Tunde. It was only 5-2, wasn't it? A Hedges hat-trick, the pick being my ball to set up the first, obviously. Personally, I had a decent first 20 and a shocking rest of the match. I thought Ed and Jack worked really well in central midfield together during the first half in particular. For us I think that Marky was potentially the man of the match, he didn't miss a lot. Keogh wins kudos for overcoming the traumatic loss of his brand new boot on the bus to play well. I probably got it wrong - official score 5-2 then! good game. really enjoyed myself this time. probably cos we won and i scored. you all need to stop blaming headges for losing. he can be stopped. mom - dunno? rich played well for the blues, so did jack. most of the reds played well too. good game good game. and he has been in the past. Defensively, I don't think the blues were actually bad, but they got it wrong tactically there. Shouldn't have been playing as high up the pitch, nor letting Hedges sit on the shoulder so much. but if only it was an inch or two closer to me then it would have been my moment of glory! I got slight fingertips to it. Really shows the small differences between success and failure on the football pitch! oh did i score an absolute peach in the top corner from outside the box? From 50 yards out wasn't it? i've got an image in my head of you arms stretched. lovely stuff. it was right off the laces. a bullet. It was a beaut. Gotta allow that, blud. Even if my match preparation was poor - some would say 'shambolic' - and it was one of the worst performances I've put in. Everything I hit was 2 yards too strong, or just plain rubbish. My brain was at the races but my body really wasn't. Oddly after all that energetic Zonino dancing I was more in pain yesterday than I am today. But I'm sure that'll change tomorrow. In terms of MOTM, I can't really comment on the Blues as I was more watching our boys but I thought all things drunken considering Bamos did really well, and meths & Jake offered great support. But Phil, Mark and Alex were our most consistent guys; Mark kept us in it in the first 30 minutes with several good challenges on the edge of the area. Kind of agree with Dan though, Hedges energy and fitness at the end was the difference. It was probably heading for a 2-2 without his name on the sheet. Hedges gets MOTM for his hat-trick, but there were several players on both teams who put in solid performances I thought. I think the blues were actually unlucky, I think it was the scrappy goal at the start of the second half that decided it - it seemed to take the wind out of your sails and let us relax a bit. I'm never going in goal again. Thanks to mark for the photo, it's GREAT. but it was going so slowly he actually got it around the penalty spot. and instead just fell over and merked my arm. was my goal that good? oh yes i remember now, it was. You didn't see me raving about my great own goal in that third game, did you? FYI it was 3 times. You and me both love. You and me both. We sounded like a right bunch of old women. However the fact we were largely all drinking again within 12 hours of Zonino is in itself quite an achievement. I stood up too quickly and deafened the poor bloke next to me with the most blood-curdling cramp scream ever. other than that, i'm completely fine. I am very much looking forward to next month's ridiculous excuse. It puts David 'TV remote' Seaman to shame. I hurt a lot this morning. Although whether it's due to the football or Zonino dancing, I'm not sure. 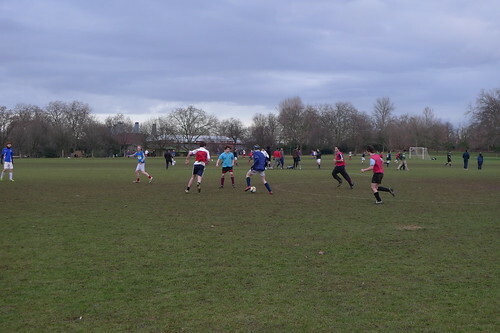 Yesterday's game was pretty scrappy, which was to be expected in the circumstances, but enjoyable nonetheless. It was a lot tighter than the score suggested, but that can't be laid squarely at the feet of Hedges. I have to say that the Blues' defence missed their absent centre-back, and the re-shuffling seemed to leave them a little out of sorts, and without someone to marshall the line. I thought that the Blues were a little naive in their positioning - sitting a little too high, which made our approach (knock it into the space behind the defence) a no-brainer, really. I thought that we were fortunate to be leading 1-0 at half time - we'd been under pressure for lots of the play but had set our 18-yard line up as the barrier, and it seemed to work, with the Blues not really getting a sniff. Our goal was probably the one moment of quality in the half, and was just about the most perfect counter-attack. Bamos made a lovely run across the back line, making my pass pretty straightforward, and his low centre into the 'zone of uncertainty' and onto the toes of Hedges was a peach. I thought that Ed played really well for the blues, but I don't think that you can look past the Reds' Alex or Keogh at the back for Man Of The Match - they were awesome. so really it was Arthur what decided it. when I subbed myself off after an hour's play. 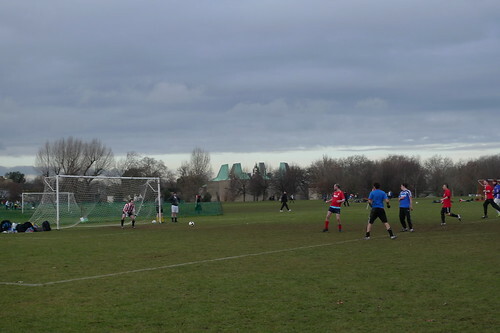 Although admittedly, the second goal was a direct result of my poor clearance. I blame the pitch. bamos tried his hardest to do your job for you on the second goal. I've never seen a striker block so many attempts at goal. Shut it you big bumclock. I did well to get an initial touch on the cross after Arthur had got a foot to it. I almost dislocated my leg in doing so. And then I had to be at my athletic best to get out of the way of Phil's piledriver. It was basically great work from me. that you'd kept up with Hedges and me. Did you know that a bumclock is a type of beetle? I didn't until I just googled it. despite my general state. I agree 5-2 was pretty harsh on the Blues. Meths's goal was spectacular though, and we sort of managed to construct some sort of a blockade on the edge of our area for most of the game. Massive thanks to Tunde for lending me astroturf boots - my trainers would have been catastrophic on that pitch. I felt like a third wheel for the entire match, even without being berated by my own teammates within earshot. Way too hungover for football. I hope my blood test comes back POSITIVE to glandular fever today too for additional excuses. I don't ache at all today, which is a dis football first. I did absoloutely no running. Great game from Jake and Dan I think. Our defence was great too. Really enjoyed it, despite a terrible opening 20 min. Pretty even teams, just slightly strange defensive tactics from the blues (Hedges is a good enough player without playing into his hands) led to lopsided scoreline. I thought blues were better first half, and blues second - the last 25 in particular I felt Dan and I had the midfield fairly tight, and red defence was solid. The whole red defence was the main difference I think - Mark was our best player first 20, Keogh had a good game and I thought Alex was motm. 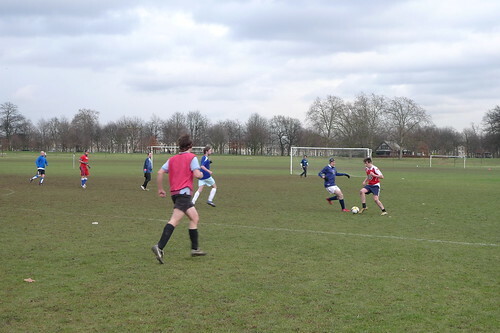 Our various fullbacks all did well too, mainly by trying to be in the right place the majority of the time. Utterly amazed at the running bamos did in the first half particularly too. Something about Dan meths trying to put the ball out for a goalkick at the end. Really good spirit as well - can't really remember any moaning or arguing at all.